Build your own colony on Mars! The San Diego Air & Space Museum has an exhibition entitled SPACE: A Journey To Our Future. A brand new selection of awesome hands-on areas make up this fun-filled exhibit! And while it is scheduled to be on display through January 2012, don’t let that be a reason for putting off this very cool experience! While featuring lots of great memorabilia from the various stages of the Space Race (including moon rocks, space suits, and collections of mission patches, pins, etc), what really drew my attention was all of the great interactive and technology based exhibits that are featured. From their 360 degree theater to an area that allows you to build your own colony on Mars, the SPACE exhibit does a fantastic job of immersing you into all things Space. Their 3D/4D theater is even playing excerpts from the Hollywood movie, “Fly Me To The Moon”! And how fun is it to experience exhibits about the future of space travel by utilizing futuristic technology? 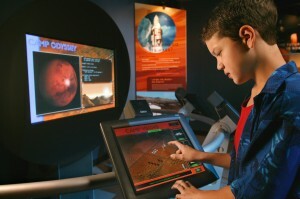 One particular exhibit uses motion-sensing technology to detect your hand movements and allows you to place parts of a rocket together to build your perfect space exploration machine. Another exhibit quizzes you on various propulsion systems and allows you to build a spaceship based on whether you intend to explore or colonize the region that you want to visit. 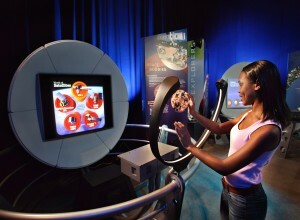 The museum even features real-life exercise machines that astronauts use while in space! Once again the Air & Space Museum has done a fantastic job of blending the fun and educational sides of learning together to make an enjoyable experience for future space travelers of all ages. This entry was posted in Arts & Culture, Attractions, Family Vacations and tagged exhibit, exhibition, moon, rocks, san diego air and space museum by Benjamin Eastman. Bookmark the permalink.